Storm tracks play a major role in regulating the precipitation and hydrological cycle in midlatitudes. The changes in the location and amplitude of the storm tracks in response to global warming will have significant impacts on the poleward transport of heat, momentum and moisture and on the hydrological cycle. Recent studies have indicated a poleward shift of the storm tracks and midlatitude precipitation zone in the warming world that will contribute to subtropical drying and higher latitude moistening. 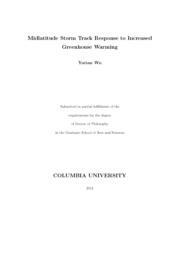 This dissertation is to investigate the storm track response to increased greenhouse warming and the dynamical mechanisms driving the changes in the storm tracks. First, by analyzing the eddy statistics simulated in the Geophysical Fluid Dynamics Laboratory (GFDL) CM2.1 model simulations (IPCC AR4 model), we confirm the poleward and upward shift and intensification of the storm tracks in the late 21st century. It has been found that this key feature is generally consistent with the change in Eady growth rate. Diagnosis of the latitude-by-latitude energy budget for the current and future climate demonstrates how the coupling between radiative and surface heat fluxes and eddy heat and moisture transport influences the midlatitude storm track response to global warming. Through radiative forcing by increased atmospheric carbon dioxide and water vapor, more energy is gained within the tropics and subtropics, while in the middle and high latitudes energy is reduced through increased outgoing terrestrial radiation in the Northern Hemisphere and increased ocean heat uptake in the Southern Hemisphere. This enhanced energy imbalance in the future climate requires larger poleward atmospheric energy transports in the midlatitudes which are partially accomplished by the intensified storm tracks. This strong connection between intensified storm track energy transports and intensified energy imbalance in the atmosphere is also confirmed in other IPCC AR4 models. We further explore the dynamical mechanisms inducing the changes in the general circulation of the atmosphere due to increased carbon dioxide (CO2) by looking into the transient step-by-step adjustment of the circulation. This allows an assessment of the causality sequence in the circulation and thermal structure response prior to establishment of a quasi-equilibrium state. The transient atmospheric adjustment is examined using the National Center for Atmospheric Research Community Atmospheric Model Version 3 coupled to a slab ocean model and the CO2 concentration in the atmosphere is uniformly and instantaneously doubled. The thermal structure and circulation response is well established after one year of integration with the magnitudes gradually increasing afterwards towards quasi-equilibrium. Tropical upper tropospheric warming occurs in the first month. The expansion of the warming in the middle and upper troposphere to the subtropics occurs later and is found to be primarily dynamically-driven due to the intensification of transient eddy momentum flux convergence and resulting anomalous descending motion in this region. This linkage between the eddy-driven vertical motion anomaly and the subtropical warming expansion in the middle and upper troposphere is also confirmed in the late 21st century in the IPCC AR4 simulations. The poleward displacement of the midlatitude tropospheric jet streams occurs together with the change in eddy momentum flux convergence but only after the intensification of the subpolar westerlies in the stratosphere. The results demonstrate the importance of the tropospheric eddies in setting up the extratropical tropospheric response to global warming. Our modeling results also show the sequence of the zonal wind anomaly in the vertical column of the atmosphere during the period of transient adjustment, indicating that the poleward displacement of the tropospheric jets follows the subpolar westerly anomaly in the stratosphere. It suggests the importance of the stratosphere and the coupling between the stratosphere and the troposphere in regulating the extratropical tropospheric circulation response to increasing CO2. Three phases are defined during this period of transient adjustment including a fast radiatively-induced thermal response in the stratosphere, a westerly acceleration in the stratosphere driven by stationary eddy anomaly, and a 'downward propagation' of westerly acceleration from the stratosphere to the troposphere followed by a poleward displacement of the tropospheric midlatitude jets. Diagnoses using wave spectra and linear index of refraction are used to understand the dynamics underlying the adjustment process.